As anyone who knows me will tell you, my three great loves in life are metal, video games and professional wrestling. As such, one would safely be able to assume that I must therefore love Fozzy, the metal band fronted by pro wrestler Chris Jericho. The truth is slightly less black and white. I have always found Fozzy to be somewhat hit-and-miss, with most of their popularity coming from the fact that they are the band with the wrestler, rather than good musicianship. That said, Jericho has long been one of my all-time favourites in the squared circle, so I am always willing to give Fozzy a fair listen. Clear growth has been made from their days as a comedy cover band, and as time goes by, their ratio of good to bad songs weighs ever further into the good. Which brings us nicely to their brand new album, "Sin and Bones". Heralded by Jericho himself as the band's best work yet, I can safely say that I agree with Y2J. "Sin and Bones" is, for the most part, a fun, unchallenging slice of retro-tinged heavy metal. If one were to assign a flavour to each sub-genre of metal, the style of Fozzy over the years would be strictly vanilla. For the most part, Fozzy are happy playing their classic, riff-based, hard-rock style of heavy metal. However, there is some noticeable thrash and groove influence, as well as an increasingly apparent progressive streak, and an extremely ill-judged glam metal episode which I will touch on later. Fozzy are not breaking any boundaries, but they are slowly expanding their scope, which results in a more varied, interesting set of songs. Also evolving is Jericho's voice. Whilst once his main reason for being in the band may have been the publicity he brings with him, the man has grown into an accomplished singer. His voice rests in the mid-high range and frequently breaks into an operatic wail, lending songs a sense of the epic. Whilst they may not sound drastically alike, a strong Bruce Dickinson influence is easy to hear. Having read Jericho claim his love for Iron Maiden in his autobiography, I am sure he would agree. The balance on Sin and Bones may be skewed toward the positive, but a few stinkers still manage to make it onto the record. "Shine Forever" is an uneventful, mid-tempo slog and "Blood Happens" features jarring death metal-style vocals in the chorus. The worst offender is "She's My Addiction", which is an outright 80s glam-metal pastiche. Glam metal was bad then, and it hasn't got any better since. For a band trying to escape their past as a tribute act, the song seems like a step backwards, and is extremely out of place considering the style of the rest of the album. The good news is, besides those three, every other song on the album is pretty darn good. Opener "Spider In My Mouth" has a great singalong chorus, and single "Sandpaper" is a catchy, groove-filled track that features guest vocals from M. Shadows of Avenged Sevenfold - a move that is sure to increase publicity. 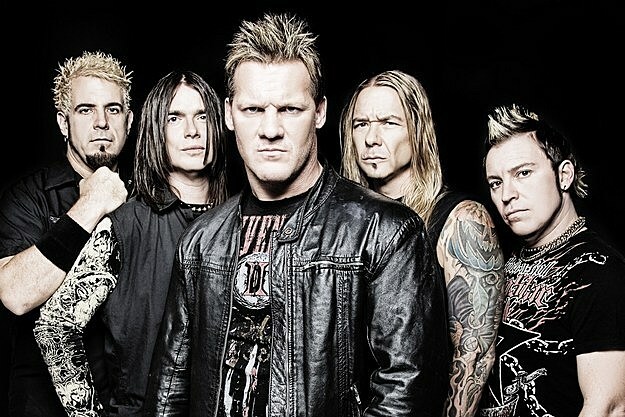 Title track Sin and Bones is one of the fastest on the album, a thrashy number that shows off Jericho's vocal talents nicely. The prog influence that bubbles beneath the surface throughout the record comes to the surface for the final song, the ten minute-plus Storm the Beaches. Ignoring the cringeworthingly cheesy intro, the track is one of the best Fozzy have ever recorded, with the WW2-inspired lyrics giving the whole thing a sense of meaningful urgency and slick guitar solos driving the song along. For my money, the best song on the album is "A Passed Life." A slow build-up with an epic pay-off, soaring vocals and melodic guitar lines - this could be an Iron Maiden song, and I mean that as a compliment. This is an all-round great song, and one of my favourites of the last few months. 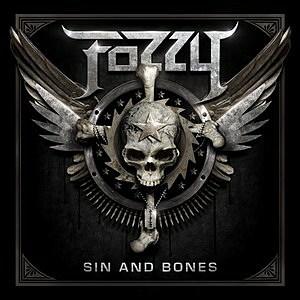 It is clear from "Sin and Bones" that Fozzy are continuing to mature as a band and find their own style. The increase in quality from album to album is easy to see and this one is another step in the right direction. 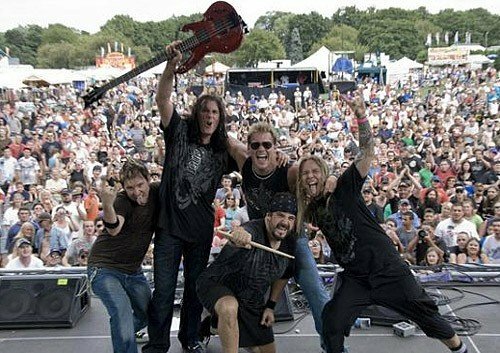 Are Fozzy a good band? Yes. A great band? Perhaps not quite yet. But if they continue to make music as decent as this, it is only a matter of time. "Sin and Bones" is a quality, enjoyable album that deserves a listen.